Dr. Harold Rhode of Ariel University says there were never any real negotiations between Iran and the West. Rather, the Americans gave in. 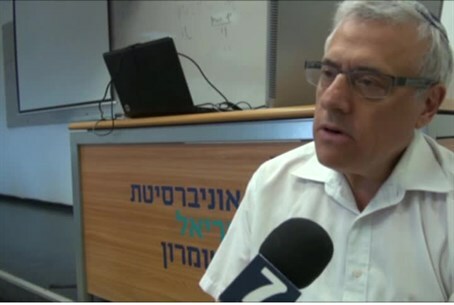 Dr. Harold Rhode, a former analyst for the Pentagon on the Middle East and today a lecturer at the Ariel University in Samaria, on Sunday told Arutz Sheva that the deal between Iran and the West was in fact an American concession to Iran. "There were no negotiations, only an American concession to Iran,” said Rhode, who studied the Persian language in Mashhad, Iran during the revolution. "The Iranians did not give up anything,” added Rhode. "For the Iranians, the agreement is a step along the way. The negotiations start with the agreement," he continued, noting he wrote a study for the United States administration about how Iran holds negotiations. “A written agreement is worth nothing [for Iran],” Rhode said. “That’s how Iranian culture has been for more than 2,500 years. They know how to play the game well. Their goal is to defeat the other side. There is no compromise, nothing. The goal is that the other side will bow its head, and that's what happened." Referring to remarks over the weekend by Iran’s Supreme Leader Ayatollah Ali Khamenei, who declared that his country will achieve nuclear weapons with or without the deal and that its attitude towards the Americans will not change, Rhode said Khamenei is a leader who strengthens his position by showing the strength of his country to his people. "The people understand that the regime is strong and they will not rise up against the regime because the Americans gave in to the regime," he said, adding that the American capitulation not only would not bring about another revolution in Iran but, in fact, makes it less likely. "I'm not a prophet. You never know what will happen in ten years, but we know that the Iranians are strong now and the Middle East is a dangerous place. There is no such thing as goodwill, not in Turkish and not in Persian,” said Rhode. "Their Führer, Khamenei, said that nuclear weapons will happen with or without this agreement, if the outside world does not intervene. Now we cannot rely on Europe and the United States. Israel must rely on itself,” he added, noting that only a Sunni coalition of Egypt, Saudi Arabia, the Gulf states and the quiet and covert support of Israel could stand up to the Shiite threat from Iran. The current situation, said Rhode, is a continuation of the struggle between Shiite and Sunni Islam that has been going on for 1,400 years. According to Rhode, many in the administration in Washington do not want to face reality when it comes to Iran. He noted the research he wrote for the Pentagon on the Iranian negotiating methods, which was based on material collected when he lived in Iran. "I saw how it worked. My research was not political, it was neither rightist nor leftist. It was based on experiences from which you can learn. I gave the project to Obama's senior officials and they threw it in the trash. The secretary who received the research told me, ‘I gave the material to policy makers and they threw it out.’ They did not want to read. They do not want to hear the facts,” he said. Rhode added that he believes that Obama's ambition is to turn the United States into a country like all other countries, a country which committed crimes against other nations and now feels the need to apologize. "Obama himself has already surrendered to the Iranians on conventional weapons. The Iranians kept pushing the Americans to withdraw another request and another request, and the United States acted without red lines,” said Rhode.